Listening to Donald Trump’s inaugural speech on January 20th led me to muse about what it might mean to live in a pre-fascist state. After reflecting on key passages and conversations with friends, I came to the view that all the elements were in place, although set before us with the imprecision of a demagogue. Yet I do not doubt that there are many ideologues waiting in the wings, perhaps now comfortably situated in the West Wing, ready to cover the conceptual rough spots, and supply an ideological overlay, and add the semblance of coherence. Considering the daily outrages emanating from the White House since the inaugural jolt, the coming years will be rough riding for all of us, with many cruelties being readied for those most vulnerable. Of course, the Woman’s March on January 21st was temporarily redemptive, and if such energy can be sustained potentially transformative. It is odd to contemplate, but there just may be tacit and effective cooperation between the national security deep state and a progressive populism converging around their divergent reasons for being deeply opposed to the shock and awe of the Trump presidency. Trump may invent ‘alternative facts’ to restore his narcissistic self-esteem, but when it comes to program he has sadly so far been true to his word! This alone should encourage a unified, energetic, and determined opposition. If the Tea Party could do it, why can’t we? Lauds the military and police as the backbone of national character, loosens protection from civilian or military abuse, which helps explain the selection of a series of generals to serve in sensitive civilian roles, as well as the revitalization of Guantanamo and the weakening of anti-torture policies. 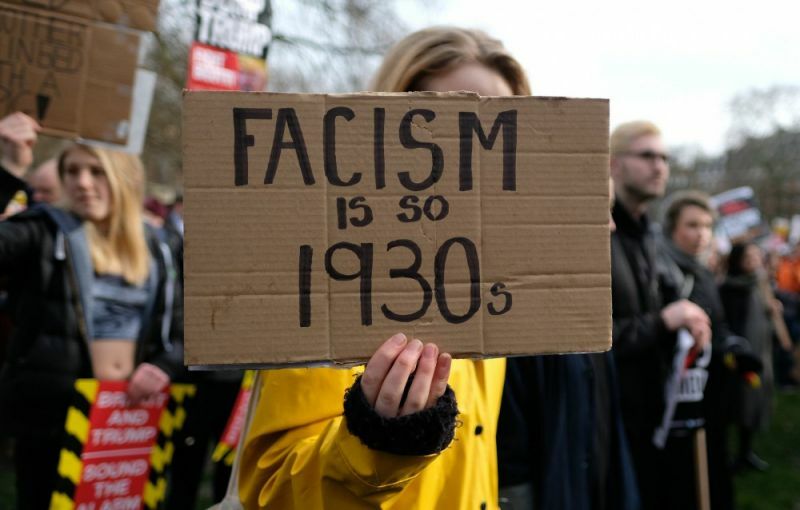 The disturbing absence of a sufficiently mobilized anti-fascist opposition movement, leadership, and program. The Democratic Party has not seized the moment vigorously and creatively; progressive populist leadership has yet to emerge inspiring trust and hope; so far there are sparks but no fire. Trump lost the popular vote, casting a cloud over his claimed mandate to be the vehicle of ‘the people.’ Furthermore, his approval rating keeps falling, and is now below 40% according to reliable polls. There is growing dissatisfaction within the bipartisan intelligence and national security bureaucracies as whether Trump and Trumpism can be tamed before it wrecks the post-1945 international order that rests on America’s global military presence, a global network of alliances, and a disposition toward a second cold war focused on hostility to Russia; if untamed, impeachment scenarios will soon surface, based not on the real concerns, but constructed around economic conflicts of interests, emoluments, and unlawful transactions. Certainly in my lifetime, with the possible exception of the Great Depression, America has not been tested as it is now. Maybe not since the American Civil War has so much been at stake, and put at risk. Traditional reliance on political parties and elections will not be helpful until the political climate is radically altered by forces from below and without or above and within. It is strange, but the two main forces of resistance to the pre-fascist reality menacing the country’s and the world’s future are progressive populism as evident in the widespread grassroots protest movement taking shape in the immediate aftermath of Trump’s ascension to the presidency, and the deep state as exhibited by the anti-Trump defection of intelligence and national security specialists from both Republican and Democratic ranks during and after the recent presidential campaign. Finally, the depiction of the present political reality as ‘pre-fascist’ rather than ‘fascist’ is crucial to this effort to depict accurately the historical moment associated with Donald Trump’s formal induction as the 45th president of the United States. To speak as if the United States is a fascist state is to falsify the nature of fascism, and to discredit critical discourse by making it seem hysterical. There is no doubt that the pieces are in place that might facilitate a horrifying transition from pre-fascism to fascism, and it could happen with lightning speed. It is also sadly true that the election of Donald Trump makes fascism a sword of Damocles hanging by a frayed thread over the American body politic. Yet we should not overlook the quite different realities that pertain to pre-fascism. It remains possible in the United States to organize, protest, and oppose without serious fears of reprisals or detentions. The media can expose, ridicule, and criticize without closures or punitive actions, facing only angered and insulting Trump tweets, although such a backlash should not be minimized as it could have a dangerous intimidating impact on how the news is reported. We are in a situation where the essential political challenge is to muster the energy and creativity to construct a firewall around constitutional democracy as it now exists in the United States, and hope that a saner, more humane political mood leads quickly and decisively to repudiate those policies and attitudes that flow from this pre-fascist set of circumstances. Richard Falk is an American professor Emeritus of International Law at Princeton University. He just completed a six-year term as United Nations Special Rapporteur on Palestinian human rights. This article originally appeared on Transnational.org. I will leave you with Gil Scott Heron singing Winter in America, from 1975. I spoke with an American Quaker today after Muswell Hill Quaker Meeting for Worship. He said that the idea of Universal Basic Income is gaining greater popularity now as a backlash to the abandonment of Obamacare, etc.